Erythrocyte Sedimentation rate (ESR) is test for acute phase reactants. It was it was described by Edmund Bienracki (S Afr Med J. 2006; 96:40-1). Though it is a commonly performed test, the ESR does not diagnose any disease. A high ESR indicates the presence of infection, inflammation or malignancy. The higher the ESR, more certain is the presence of one of these diseases. Acute phase response is the reaction of the body to infection or inflammation. Though called acute phase response it is seen in both acute and chronic inflammation. Acute phase response is also seen in malignancy despite the apparent absence of inflammation. It is characterised by increase, at least by 25% (Ann N Y Acad Sci 1982; 389;39-48), in the levels of many substances and a fall in the levels of some proteins. The substance s that increase include TNF-α, IL-1, IL-6, cortisol, C- reactive proteins, haptoglobin, serum amyloid A protein, ceruloplasmin, fibrinogen, hepcidin, ferritin, procalcitonin, The substances that decrease include albumin, Transferrin, retinol-binding proteins, trasnthyrin. ESR may be performed by one of two methods – Westergrens and Wintrobes. The Wintrobe tube is a smaller and shorter tube making the reading less accurate. The international Council and Standardization in Haematology recommends the Westergrens method be used for estimation of ESR. Westergren’s tube is a round, colourless 30cm long glass tube with a bore that is at least 2.55mm. The lower 20cm is graduated in millimeter. Plastic tubes may show adhesive properties towards blood or may release plasticizers that me affect the sedimentation rate. If plastic tubes are used it should be ensured that the plastic does not interfere with ESR estimations. Usually ESR is performed on a blood sample collected in EDTA. The sample is diluted in a solution of 109mmol/L (32g/l) trisodium citrate (Na3C6H5O7.2H2O). Four part of blood is diluted in one part of trisodium citrate solution. While EDTA anticoagulated samples may be used to perform ESR for up to 24 hours after collection if stored at 4°C, the test should be performed on sodium citrate diluted sample within 2 hours if the sample is stored at room temperature and 4 hours if stored at 4°C. The sample is thoroughly mixed and drawn in the ESR pipette till the 200mm mark using a mechanical suction device or a teat. Mouth pipetting should not be done. The tube is mounted exactly vertical in the rack and left undisturbed for 1 hour. The height of the clear plasma at the end of 1 hour is the ESR. The results are expressed in millimeter in 1 hour. The value of ESR is determined by a balance between the tendency of the erythrocytes to settle under the influence of gravity and that of the plasma to impede this process. Erythrocyte Factors Determining ESR: The erythrocyte factors that influence ESR are rouleaux formation, haematocrit and presence of erythrocyte anomalies. Rouleaux Formation: Rouleaux formation is formation of stacks of erythrocytes (figure 1). 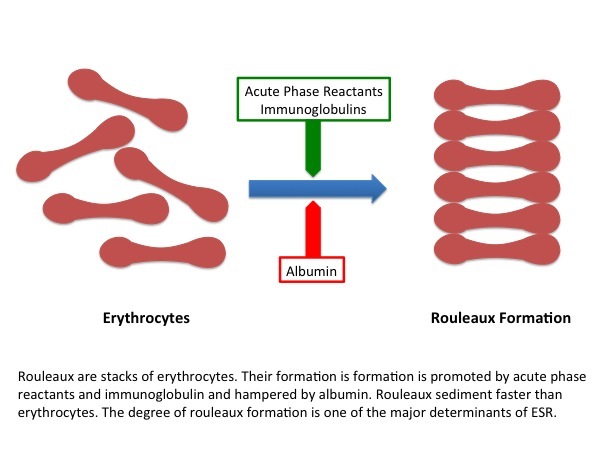 Rouleaux promote the sedimentation of erythrocytes and are have the strongest influence on ESR. Rouleaux formation is promoted by acute phase reactants, particularly fibrinogen. Albumin impedes rouleaux formation. Haematocrit: The ESR increases as the haematocrit falls. Erythrocyte Anomalies: The erythrocytes of patients with sickle cell anaemia, microcytosis, hereditary spherocytosis and acanthocytosis sediment slower than normal erythrocytes. These conditions are characterised by a low ESR. Sickle cell crisis result in acute phase response. The ESR increases in sickle cell crisis because of the influence of acute phase reactants. Plasma Factors Determining ESR: Hypofibrinogenaemia (e.g. disseminated intravascular coagulation) decreases ESR. Neonates have a low ESR (0-2mm). The ESR of children is the same as adult males (0-15mm in 1 hour). There are no gender differences. Women have a higher ESR (0-20mm at 1 hour). The ESR increases with age after the age of 40 years. The increase is more marked after the age of 60 years. The ESR shows a slight fall after the age of 75 years. ESR rises in pregnancy and lactation. Infection, inflammation and malignancy cause increase in ESR. An ESR > 100mm in 1 hour is strongly suggestive of chronic infection, rheumatological disease or a malignancy. The specificity of ESR > 100mm in 1 hour to diagnose chronic infection is 0.9 and the positive predictive value is 0.9. ESR is not diagnostic of any disease. A high ESR suggests the presence of infection inflammation or malignancy. Higher the ESR more likely is the possibility of one of these diseases.